Green Cameroon plants more than 500 trees in the Mount Cameroon Forest Region. Wednesday the 28th of June 2017 marked a very busy day for the staff of Green Cameroon and the Communities of Woteke, Ewonda and Bonakand. 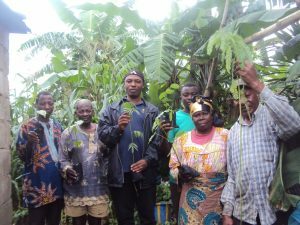 Under the Green Mount Cameroon Project which was funded by the Eco-Peace Leadership Center and the Yuhan-Kimberly, these communities had to come together to materialize a dream which they had nursed for the past 8 months. Some time in the month of November 2016, the Green Mount Cameroon project was launched with the intention of conserving biodiversity in the Mount Cameroon Forest Region by reducing the pressure mounted on our forest by community members in their demand for wood intended for household heating. The project was developed to provide alternative sources of wood and replacing the already lost forest in this area through the planting of at least 1000 trees in this region. The project came under 3 phases consisting of, an education and sensitization phase, training and capacity building and finally a practical tree planting phase. Wednesday the 28th of June 2017 was therefore the day on which these communities came together to plant more than 500 trees which they had themselves nursed, taken care of and practiced on. The planted trees were nursed for different purposes such as for water catchment protection, medicinal use, shade, agroforestry and ornamental uses. 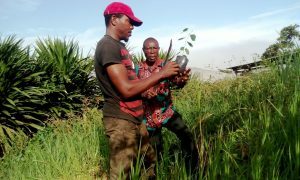 The trees were planted at the Woteke water catchment, community forest, along the streets and in compounds of the other communities and on the farms of individual farmers from these communities under the supervision of Green Cameroon’s staff. In the upcoming days, more planting campaigns will take place in these same communities and beyond to meet up with the target of 1000 trees goal that was set at the beginning of the project. The exercise which started very early in the morning was culminated in the Woteke village where the planting team settled down for refreshment and to congratulate themselves for a job well done. The Director of Green Cameroon at the end of the day beseeched the beneficiary communities to endevour to make sure that the planted trees are well taken care of and that the nurseries put in place are mentained and utilized to yield maximum benefits to these communities. On their part, the Village Traditional Councils through their Chiefs and Chair Persons promised to take good care of the trees and appreciated the effort of Green Cameroon, the Eco-Peace Leadership Center and the Yuhan-Kimberly for such a valuable gesture and prayed that the collaboration between their villages and these institutions continues in future. It is hoped that once the project meets with its target of 1000 trees in these communities, opportunity shall be given for some interested individuals and communities to also benefit from these communities through the donation of trees for onward planting. 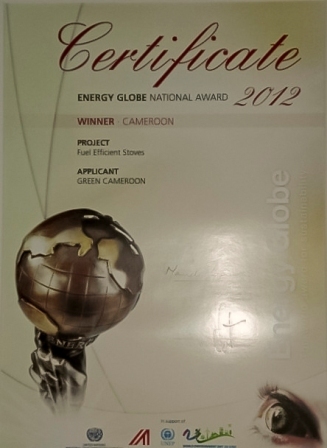 Join Green Cameroon for the Change You Need!!! ← Green Mount Cameroon!! Trees Soon To Be Ready For Planting!! !